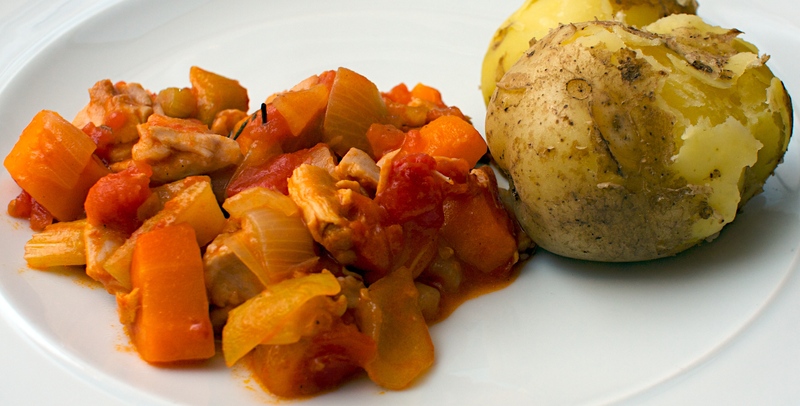 Genuinely retro, but really simple and tasty casserole. Roughly chop the celery, onions and carrots. Heat a large casserole over a medium heat. Add 2 tbsp of olive oil and fry the vegetables and thyme for 10 minutes. Add the chicken and the flour and stir well. Then add the white wine and tinned tomatoes. Stir again and season well with salt and pepper. Bring to the boil, then cover and cook in the oven for 1½ hours. Check it after an hour and add a splash of water if it looks a bit dry. Taste for seasoning and serve with some steamed potatoes and green veg.